Dress up a plain pullover or cardigan with these great accessories designed by Lee Gant. 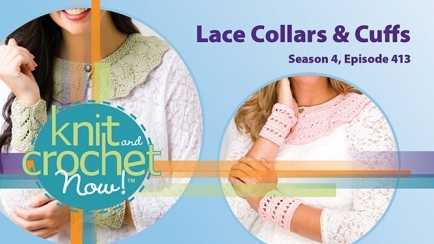 Maggie Pace shows you how to knit the scalloped lace collar and cuffs, while Robyn Chachula demonstrates the more tailored crochet version. 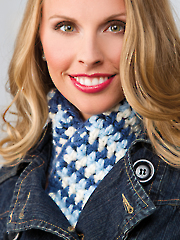 Brett Bara makes a quick-crochet scarf with three colors of chunky yarn. Love the collar & cuffs in both knitting and crochet. Brings back memories of the ones my mother made for me many moons ago! Looking forward to making these patterns. Thank you!